Breathtaking Views, Unique Tropical Experience, Pool/Hot Tub & Great Service! 5 STARS - DISCOVER the PERFECT VACATION INGREDIENTS of Ocean Kaleidoscope Villa. OCEAN KALEIDOSCOPE VILLA is ready to WELCOME you back, or for your first experience at "YOUR VACATION HOME IN THE CARIBBEAN"!! This is a strong concrete and steel house, with complete amenities, and now equipped with a new 20k whole house standby generator! Guests will appreciate the space, privacy, and convenience of this property’s sleeping and living arrangements! OCEAN KALEIDOSCOPE VILLA is the PERFECT accommodation for large or small groups planning family vacations, buddy trips, or work junkets. With it's UNIQUE LAYOUT, this property consists of 2 stand alone units, each with 1 bedroom/1 bath, that are INCLUDED in every reservation. The spacious Ocean Retreat unit is defined by a king bed and queen sofa pullout, full bath, full kitchen and living area, large covered patio, covered lounge, and pool/spa deck. While a few feel away, but within the perimeter of the fenced grounds, is the delightful Serenity Cottage, complete with queen bed, full bath, kitchenette and private covered deck. 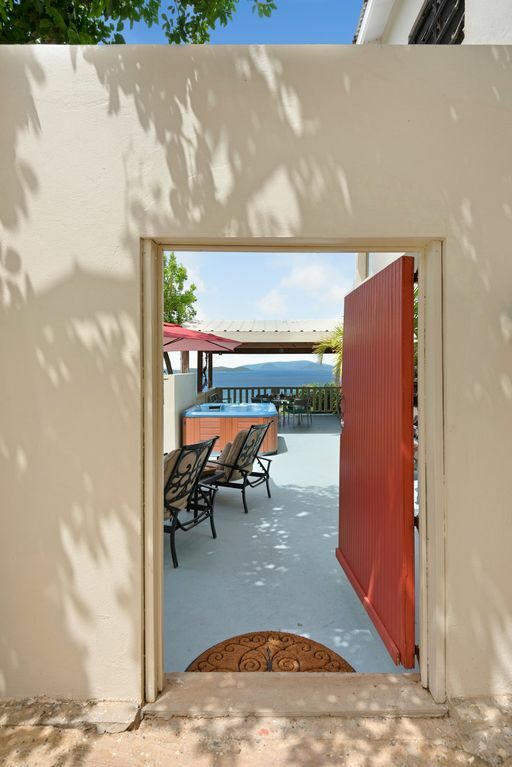 Nestled in St. Thomas' eastern tip, cradled among gently sloping hillsides, this tropical oasis tantalizes the senses with a breathtaking 180-degree view of Pillsbury Sound! So close you can almost touch them, the outlying emerald green uninhabited cays of the US Virgin Islands (Lovango, Mingo, Grass, Thatch) and eco-friendly St. John Island, as well as islands of the BVI (Tortola, Jost Van Dyke), rise majestically out of an inviting sapphire blue Caribbean Sea. Enjoy gentle tropical breezes, whispering surf, and the melody of native birds while you read or enjoy your morning coffee. Bask in the crystal waters of a sun drenched pool, surrounded by a tropical landscape, and then relax in the soothing spa under a star-filled night sky. Or dine outside while admiring the shimmering glow of the sun or full moon on the undulating ocean waves below. The dense natural foliage and a carefully planned property layout offers personal and discreet solitude. Enjoy tasteful rattan furnishings, colorful caribbean styles and artwork, and quality amenities that enhance the character of an island home. OCEAN KALEIDOSCOPE VILLA embraces you in the feeling of seclusion, while only being 5-15 minutes away from pristine beaches (the nearest within 1/4 mile and 3 minutes driving), savory island cuisine, exhilarating marine adventure, challenging golf links, shopping bonanzas, water sports, and island hopping. This is ‘Your Vacation Home in the Caribbean’! From arrival to departure the OCEAN KALEIDOSCOPE VILLA experience is customized to your standards of vacation excellence and enjoyment. Your 24/7 on-site concierge hosts, island residents and ambassadors with customer service and hospitality practice for 40+ years combined, are available to you at your discretion for any questions or requests. OCEAN KALEIDOSCOPE VILLA is best suited to mature, considerate, happy global travelers, who appreciate a budget friendly, zen, roomy, well appointed and harmonious vacation home, which welcomes all individuals, families, lifestyles, and affiliations equally and respectfully. toilet, shower, Shares outdoor shower with Ocean Retreat. Bathrooms custom designed with granite and porcelain vanities, glass, stone and mosaic tile designs, and glass enclosures and doors, with brushed steel hardware. A short 2 - 10 minute drive to several nearby beaches, or a 15 minute walk downhill and back will take you to 2 beautiful beaches (Smith Bay and Sapphire Beach). A tropical beach coastline is visible DIRECTLY below this property. The outer islands of St. John, Tortola, Jost Van Dyke, as well as several other outlying uninhabited islands and cays are part of a dynamic ocean view. 180 degree view overlooks Pillsbury Sound... a boaters paradise, that connects the US Virgin Islands (USVI) to the British Virgin Islands (BVI). A 180 degree view of the Caribbean Sea, from all angles. Ocean Retreat: (2) wall units. Serenity Cottage: (1) wall unit. Ocean Retreat: Indoor dining available for 4. Outdoor dining also available for 8. Serenity Cottage: Patio dining available for 2. SMOKING ALLOWED OUTSIDE ONLY. STRICTLY ENFORCED. 5 person Hot Springs model. East End, Overlooking 5 minutes drive from the enclave of Red Hook. Island Hopping by Ferry to Nearby Islands, Duty Free Shopping, Great Restaurants and Bars, Marine Park, Sea Trekking, Snuba, Movie Theatre, Wave Runners, Kite Surfing, Horseback Riding, and lots more. BOOK DIRECTLY WITH VILLA (No Service Fees. $300 damage deposit waived in lieu of valid credit card presented at check in.) - Add 5% for Direct or PayPal credit card payments. Accept personal checks, bank cheques, money orders and cash payments. - $200 service fee for reservations of less than the minimum stay requirement. - Additional fees may apply for Pet Stay. $50 Non-refundable pet sanitation cleaning fee/pet. - 3four0six9zero2nine7five NIGHTLY RATES: All published base rates for 1- 2 person occupancy. Add $35 per additional guests. Children 4 years or younger stay free, limit 2 per reservation. All published rates reserve access to BOTH UNITS, the Ocean Retreat + Serenity Cottage. All rates and availability subject to change without notice or publication. MONTHLY RATES: Published rates based on 2 guests. $35/add guest. Includes Water, Electricity UP TO 600 KWH/mnth (over 600kwh charged on CC) + satellite and internet services + 2 mandatory full housekeeping services per month + pool/spa/deck maintenance and cleaning + 24/7 on-site management. Security deposit $1,000. SPECIAL OFFERS/PROMOTIONS: Discounts not to be used in combination with other discounts, offers, promotions, or monthly booking rates. Applied to base rates ONLY, not inclusive of fees (additional guest, service, or pets). Reservations must satisfy minimum stay requirements to qualify. REPEAT GUESTS receive special member discounts. RESERVATIONS: All quotes are non-binding prior to the execution of a signed or accepted contract. Reservations confirmed with full payment. Advance copy of the current and complete rental terms, cancellation policies and all other rental details available online or by request. PROPERTY USAGE: Due to liability, cost, and additional wear and tear, occupancy and use of all amenities is restricted exclusively to registered and paying guests only. Please see the "Restrictions on Occupancy", "Restrictions on Property Use", and "Liability" sections of the contract.